← Windows 7 "microphone-in" problem with Audacity software. This is one of the easiest and best tasting cakes I’ve ever made. I’m not a frosting person — I like the cake. This is one of my favorite recipes because it has a crusty topping and doesn’t require frosting. If you like the icing on your cake, you can always slather on your favorite frosting. I promise not to tell. NOTE: If you will be using frosting, omit the topping. 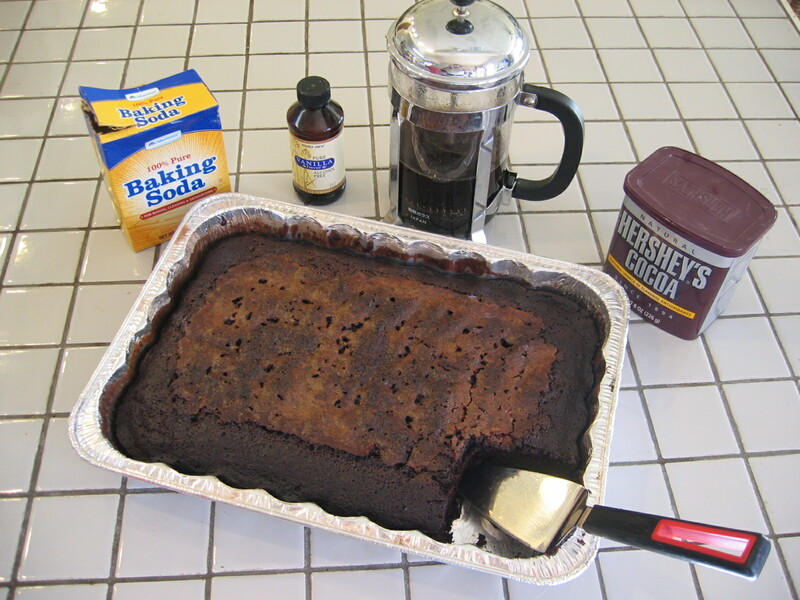 Put all dry cake ingredients (flour , 1 1/2 cups sugar, cocoa powder, baking soda and salt) into an ungreased 13x9x2 metal baking pan. Stir with a fork until well mixed. Form 3 wells in flour mixture. Pour oil into one well, vinegar in the second and the vanilla into the third well. Pour the cold coffee or water over all ingredients and stir with fork until well mixed. DO NOT beat. TOPPING: Sprinkle the sugar/cinnamon mixture over batter. Bake in a 350°F oven for 35-40 minutes. This entry was posted in Recipes and tagged cake, Recipes. Bookmark the permalink.